With the chilly mornings we have been having lately, it puts me in the mood for the popular coffee chain's warm drinks. However, I have been little bothered with their menu lately. It's wonderful that the pumpkin spice drink is back. I am so happy for the people that get their drink back. But what if you're not the pumpkin spice type? 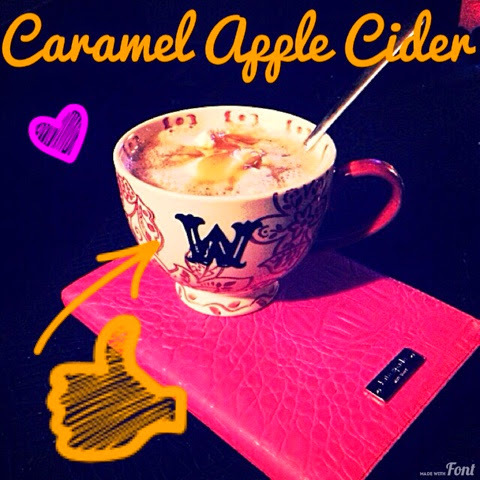 What if you are the simple girl who just really wants a tall caramel apple spice cider? I understand there are not very many of "us" around. The ones that order the drink as is...not extra whipped, not with skinny milk but extra sugar, not with 2.73 oz of creamer...AS IS! When fall comes around, I want my apple cider, not the pumpkin spice thing that everyone is drinking. I don't like pumpkin that much! Since my yummy apple cider is not on the menu yet, I will just have to make my own! And just maybe, I will add a touch of vodka to really spice up my day! 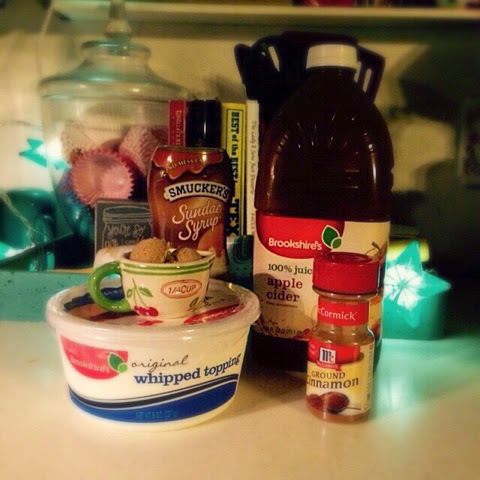 The grocery list is pretty simple: A jug of apple cider (makes multiple cups), brown sugar, ground cinnamon, whipped topping and caramel sauce. 1. Heat 1 1/2 cups of apple cider in a small sauce pan. I made sure not to boil mine; just heat it. 2. While the pan is still on the heat, add 1 tablespoon of brown sugar. Stir well, making sure the brown sugar dissolves. Before removing from the heat, add a pinch of cinnamon. 3. After adding the cinnamon, stir one last time really well. 4. Pour the cider into a mug. Add a scoop of whipped cream and drizzle caramel sauce over it. I made some to go with my dinner tonight. My kids were stealing sips while I made their plates! So after dinner, the kids got their own small cup (and a promise to make more this weekend!). I am thinking the next time I make a cup for me, I made add a dash of caramel flavored vodka. I did not have any on hand tonight. If I give it a try, then I will let you know how it is. Hope you enjoy this as much as I did! !